Inventory in March was at 6,595, which eased the months of supply to five months. An improvement compared to the past several months, but nonetheless considered saturated in as to levels in March traditionally recorded. 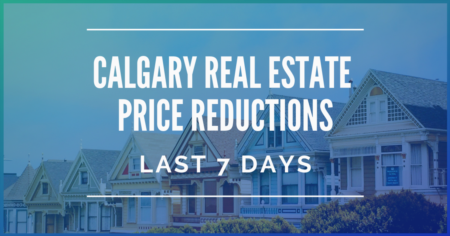 Further price declines this month due to the oversupply in the Calgary market. Benchmark prices eased to $413,900 as of March, just below levels recorded last month and five per cent below levels last year. Sales in the first-quarter dropped almost nine percent and 30 per cent below normal levels of activity compared to last year. Depending on location and price range detached sales were varied, with increases occurring largely in the price ranges of each district that are most affordable. 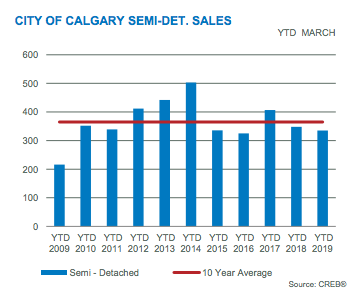 Citywide detached sales improved in March for all homes worth under $500,000. Inventories increased over last year's levels, with months of supply ending at the highest level ever recorded for the month of March, despite easing in new listings. Compared to last year as per activity by district, the North East and East districts have seen the level of oversupply eased. Detached sector oversupply continues to weigh on prices across all city districts. 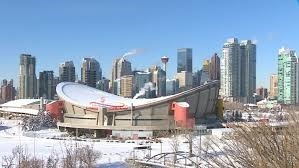 Benchmark prices citywide for detached eased 5.4 per cent for a total price of $475,800 compared to last year. Sales in condominium resale decreased by 14 per cent in March, totalling first-quarter sales to 464 units, which was below last year by 17 per cent. Declines did not take place in all districts, as improved sales activity were seen in the North and West city districts. Activity remains well below long-term trends, despite signs of improvements in those districts. Compared to last year's levels new listings eased again this month. Supply in this section has seen signs of adjustment to the lower levels of demand. This adjustment is impacting inventories, unlike other property types. March's inventory was 12 per cent below last year's levels at 1,488 units. Levels recorded earlier in the year for months of supply has decreased, but is elevated compared to last year's levels due to weak sales. 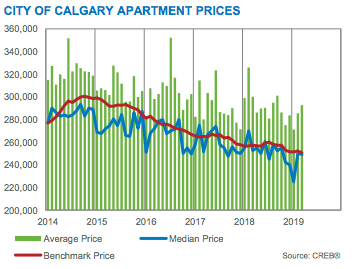 Apartment condominium prices citywide decreased 2.6 per cent over the last year and 0.7 percent from last month. However, prices have shown a modest increase over last year in both the North East and South East districts. As a result of improvements in the semi-detached and row sectors there was a slight boost in attached sales in March. Year-to date sales, despite the gains in March, remain 16 percent below long-term averages and 4 per cent below last years levels. Sales year-to-date have eased, however there were improvements in the South and South East. Citywide months of supply continue to be elevated, even with some improvements in sales. Semi-detached prices continue on a down trend. Benchmark price for March was $391,000, 0.4 per cent below last month's price and nearly six percent below last year's levels. Nonetheless, the North district had shown other results, as months of supply tighten supporting a modest gain in prices compared to last year and last month. Compared to February levels row prices remained relatively flat, but continue to be over 13 per cent lower than previous highs and more than four per cent below last year's levels. New listing numbers declined by 47 units and first quarter sales were seven units less than last year's levels over the same period. Preventing any significant change in the markets inventory levels. Months of supply however remain elevated averaging five months after the first quarter. Benchmark first quarter prices citywide eased by 1.7 per cent compared to the previous quarter and continue at 4.6 per cent below recorded levels for last year's first quarter. Weighing on prices is the persistent oversupply in the market. The largest decreases occurred in the apartment sector, while prices eased across all property types. 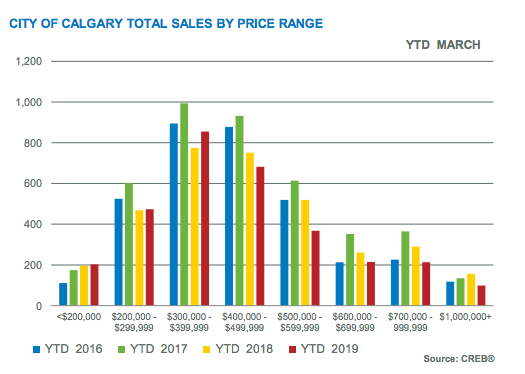 New listings and first quarter sales were 330 units and 114 units for Cochrane, respectively, together decreasing over last year's levels. Yet, the upsurge pull-back in sales effected the months of supply to average eight months in the first quarter and caused inventories to increase. Oversupply persisting in the market has continued to weigh in on prices. Benchmark prices after the first quarter has eased by 1.5 per cent compared to the previous quarter and by 1.6 per cent in comparison to last year. Year-to year decreases however were higher in the attached sector at 2.7 per cent compared to 1.5 percent in the detached sector. Sales and new listings in the first quarter decreased in comparison to last year. 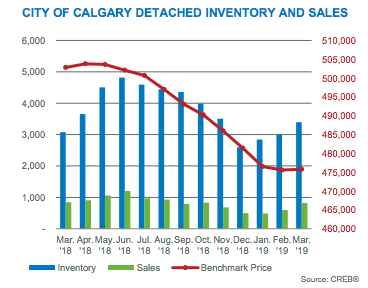 Months of supply sustained elevated levels averaging 7.7 months in the first quarter, even with the pull-back in new listings this was not enough to reduce market inventory levels. As oversupply continues this impacted prices. Benchmark price for detached averaged $413,733 in the first quarter being 3.8 per cent below the fourth quarter of 2018 and a 4.8 per cent decrease compared to last year. Slightly higher price decreases in the attached sector with a total of $376,433 for benchmark price in the first quarter, a five percent decrease over the previous year.